Topical spy thriller involves highly charged political and national security issues. VOD and DVD release dates set for November. LOS ANGELES (July 2017) The team behind the timely national security thriller “Magnum Opus” announces it has acquired domestic and international distributors. Gravitas Ventures will administer distribution domestically, while Screen Media International has been handling international sales, and will continue to present the film to foreign buyers at MIPCOM and AFM. The film will be released on VOD and DVD this November. Set primarily in Daniel Cliff’s loft—with flashbacks to Desert Storm—the action seethes with a sense of urgency. Gradually, the story conveys the unexpected interconnectedness of the main characters. In addition to the outwardly difficult Cliff and his gallerist, Sean Dabashi, the principal characters in “Magnum Opus” include: the inquisitive and aggressive female gallery curator, Monica Davenport; Private Sattler, a sadistic Desert Storm soldier whose actions cement Cliff’s commitment to expressing truth through art; and Robert Cochran, the former commanding officer whose conscience is divided between doing what is right and what is right. It’s this ambivalence cloaking contemporary issues of national intelligence, freedom and privacy that provides the thrust to the script’s narrative power. “Magnum Opus” marks the debut of director Kevin Elliott and screenwriter Scott Stoddard and was filmed by award-winning cinematographer Bobby Lam (“Best Cinematography – Narrative Feature” for “A Leading Man” at the Los Angeles Asian Pacific Film Festival). Newcomer Amanda Upson and TV and film production veteran Marc Newland serve as producers. It stars Louise Griffiths as Monica Davenport (“Unknown Caller,” “The Revenant,” “Chastity Bites”), Adam J. Harrington as Daniel Cliff (“TURN: Washington’s Spies,” “CSI,” “Training Day,” “NCIS: Los Angeles”), Clark Johnson as Robert Cochran (“The Wire,” “Alpha House”) and Pej Vahdat as Sean Dabashi (“A Girl Walks Home Alone at Night,” “Bones,” “Shameless,” “Sneaky Pete”). Norm Lewis will appear as Charlie Lutwidge (“Scandal,” 2012 Tony Award-nominated actor for his lead role in “Porgy and Bess”) and Dustin Ingram as Private Sattler (Martin Scorsese’s HBO series “Rock and Roll,” “Paranormal Activity 3”). In addition, the film features the signature “Oilgraph” paintings by artist Kevin Rolly and a score by composer Erik Aho, 2013 recipient of the ASCAP Foundation’s David Rose Award, whose film and TV credits include original music for “The Amazing Race” (ABC) and “The Bachelor” (CBS). 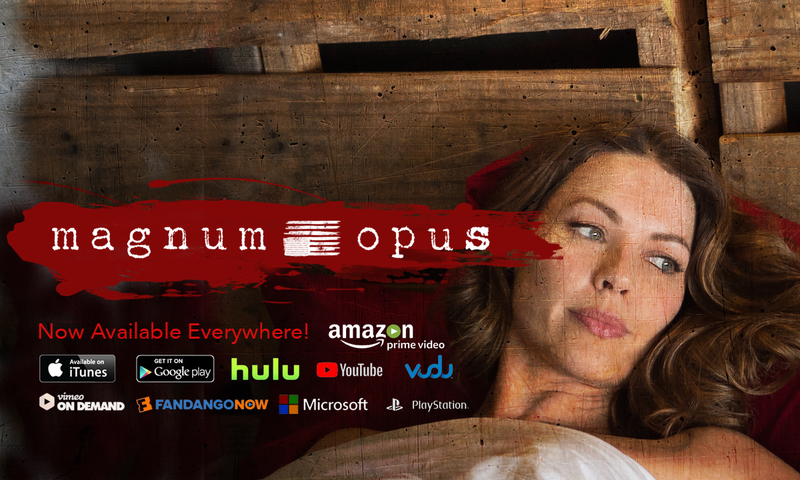 For more information about “Magnum Opus,” visit IMDB, follow on Twitter @MagnumOpusMovie, Instagram @magnum_opus_movie or like on Facebook at www.Facebook.com/MagnumOpusMovie.